The Royal Experience: London's most unique Afternoon Tea Venues | Food Lovers Tours, Ltd.
2018 is the year for ROYAL festivities. With Harry and Meghan set to tie the “royal” knot on May 19th, London is going to be extremely busy welcoming lots of well-wishers to see the Royal Wedding at Windsor Castle. That means all of the Royal Wedding Well-wishers will be thinking British, eating British and, of course, drinking British. 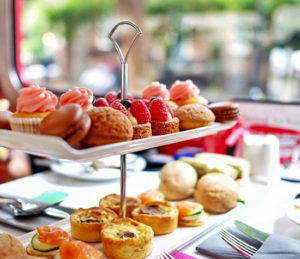 One of the most famous “Royal” British traditions is the Afternoon Tea experience. Whether you’ve received your illusive Royal invitation, or not, that doesn’t mean you can’t enjoy a fabulous Afternoon Tea Tasting like a local. 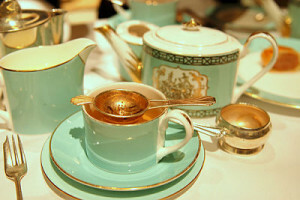 We have put together a list of our favourite tea houses (fit for a royal) in London. You can stop by one of these interesting venues to help channel your inner British and raise a tea-cup to the happiest couple on May 19th. Founded in 1707 on Duke Street and inventing the humble scotch egg for travellers, Fortnum and Mason’s has been supplying its excellent tea to the Royal Family since 1814! In the Diamond Jubilee Tea Salon, opened by Her Majesty Queen Elizabeth II, you can experience the full Royal Treatment of High Afternoon Tea. 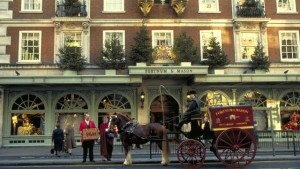 From Finger Sandwiches of Coronation Chicken or Fortnum’s Smoked Salmon, to Scones and Cakes galore Fortnum and Mason’s truly has it all. Even offering tables on the big day, soak up the festivities at one of London’s and the Royals’ favourite spots for a spot of tea. “Wonderful”, “Excellent”, “Elegant”, these are just some of the adjectives used to describe the Corinthia Hotel’s stunning Afternoon Tea. Served in The Crystal Moon Lounge beneath the Baccarat Chandelier, the Corinthia’s affair is more in the Modern style, but with classics such as: Scones and Jam, Finger Sandwiches and artisanal breads give the customer a sense of the true high-life. 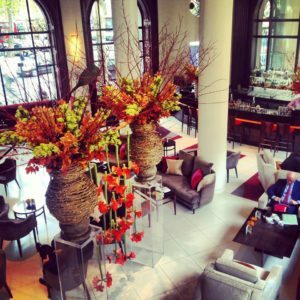 Attended by your very own tea sommelier, be in the very heart of London at the Corinthia, in Whitehall, right next door to Buckingham Palace. British than the combination of the distinctive red Double-Decker Bus and Tea? Well, now, the pair have teamed up to deliver the most British event that has ever existed. 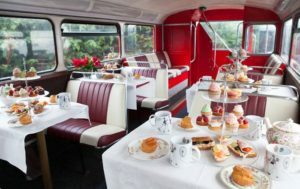 Whilst seeing some of Central London’s most loved sights upon the bus, you can wash it all down with a selection of the fabulous Brigit’s Bakery cakes and Afternoon Tea. This experience is a surefire way to celebrate the Royal Wedding the right way in Britain’s capital. 4. 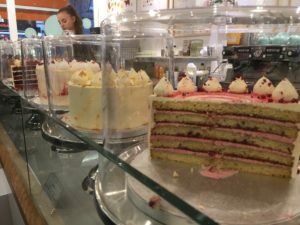 Cutter & Squidge – Unique Underground Tea-House with a Delicious (and “healthier”) selection of Homemade Cakes! Have you ever wondered why the world would make such a cruel creation as “frosting”? The flavours are sweet, the texture like a soft cloud…and just like that, you are already demolishing your 4th slice! Why can’t cake be healthy?! Brace yourselves: we may have just found the answer to your prayers….Cutter & Squidge. They make the most incredible DREAM CAKES and yet – keep their fat and sugar content to “just as much as needed to make something delicious”. Eating cake without the hint of a guilty conscious rearing its ugly head?? Sounds good to us!! The sisters who own this fab little shop also offer wedding services! 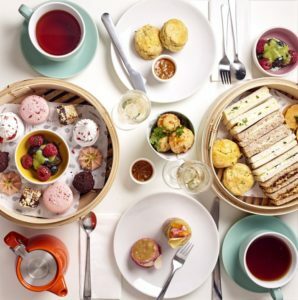 Opened by Alan Yau in 2011, Yauatcha is one of the most beloved Cantonese restaurants in London. It has won multiple awards – one of which, a prestigious Michelin star. Inside the restaurant, Yauatcha houses a fabulous patisserie, making it one of our top choices for Afternoon Tea. 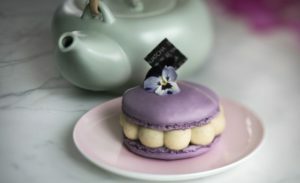 What better way to celebrate the historical royal wedding than with an affordable pairing of some beautiful macaroons and a selection of teas from the Far East: it’s a British fare with a twist. 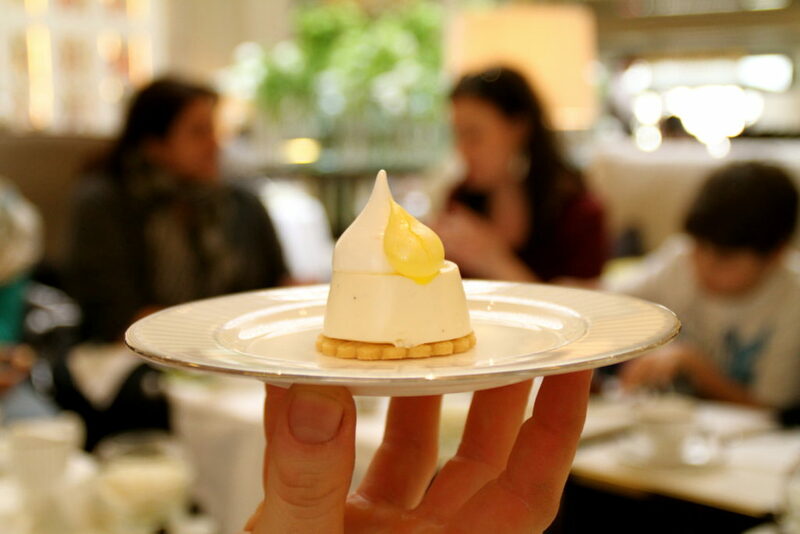 We love their desserts so much that we even stop here on our Tastes of Soho Afternoon Tour. 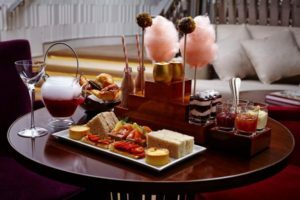 As previously mentioned in our Easter article, at the five-star hotel One Aldwych they are offering a Charlie and the Chocolate Factory themed afternoon tea. From golden chocolate eggs and chocolate caramel milk to playful homemade candyfloss, Roald Dahl’s classic children’s tale comes to life. Winner of the ‘Best Afternoon Tea in London’ this activity is on the higher scale in terms of budget, but for pure inventiveness and uniqueness this is an Afternoon Tea worth doing. Set your eyes and taste buds alive in wonder and disbelief at their srumdiddlyumptious treats, whilst raising a tea cup to the happy couple. 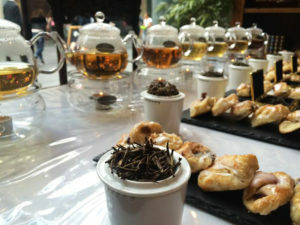 Are you interested in a top quality Afternoon tea experience without the tourist crowds of the West End and Soho? 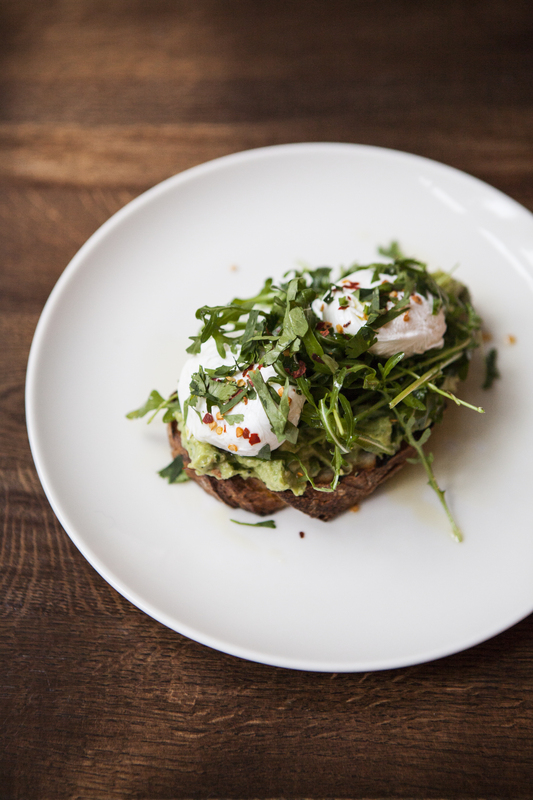 Look no further than the East End – where exciting and different restaurants seem to be springing up quicker than we can get the word out. 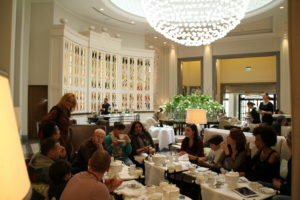 The latest offering, set in an old vintage clothing shop turned gourmet high-end tea house is the London Tea Exchange. 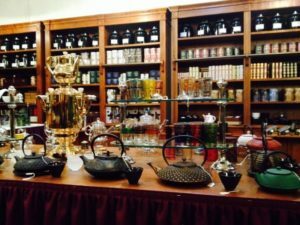 Their incredible collection features over 300 varieties of premium teas and rare teas that are sourced directly from twenty different countries and includes some of the rarest teas in the world – many of which are exclusive to them. Nestled in between hipster hangouts and vintage clothing shops, London Tea Exchange is in the perfect location to take a break from the food stalls and artsy mobs that swamp Brick Lane. Their staff is so knowledgable that you may think you want to try one tea and get convinced to try something totally different – and love every drop!! If you spend enough time there, you could become the perfect tea connoisseur for when the Royal Family’s tea connoisseur mysteriously goes missing… there are different ways of getting to the wedding! 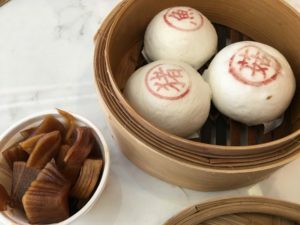 Heading back to Soho, Bun House is serving Canton-styled buns which you can wash down with independent Hong Kong craft beers and takes its inspiration from open-air street food stalls of Hong Kong. But for the purposes of this article we are focusing on what is underneath the Bun House. In a dim lit room, full of red velvet booths Bun House have their very own underground Tea speakeasy! 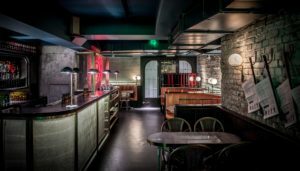 Inspired by the old-school drinking dens of China, this hotspot verges on the quirkier side of London’s famous and numerous tea houses. This location makes a good sense for the after-party of the celebrations of the Royal affair! If you would like any more suggestions as to where to eat and drink London Food Lovers is running tours in Soho, the East End and Borough Market to celebrate the Royal Wedding in a true foodie style! Happy Eating (and drinking TEA) like a Royal! 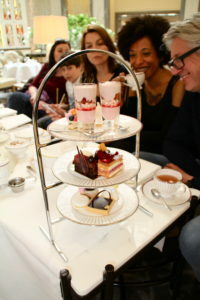 This entry was posted in Uncategorized and tagged Afternoon Tea, London Tea houses, Royal, Royal family, Royal festivities, Royal Wedding, Tea house.